Posted on January 19, 2014 by Financial Underdog	in education, history. Canadian banknotes can be truly fascinating! While going through my wallet, I found a new $10 banknote that is currently in circulation. The ten dollar bill (polymer series) once again features some of Canadian pride and one of the most prominent politicians in Canadian history. Sir John Alexander Macdonald was the very first Canadian Prime Minister and served for a number of terms (1867–1873, 1878–1891). After his family immigrated to Canada from Scotland, he became a lawyer and shortly after got involved in politics slowly rising to the top of the political scene. His actions helped shape Canada as we know today. Dominion of Canada came to existence on July 1st, 1867. Same day, Sir John Alexander Macdonald was knighted (hence “Sir”) and appointed the Prime Minister of newly formed government. Shortly after, the very first general elections were held in Canada. Interestingly enough, back then no secret ballots were used and votes were made public. Under his rule, Trans Canadian Railway slowly came into existence and was completed after years of planning and design. The entire project was extremely expensive for such small nation, and required heavy borrowing, negotiations, and compromising. Few times the project almost went bankrupt – but it was finally completed on November 7th, 1885. Mount Macdonald at Rogers Pass, Ottawa Macdonald-Cartier International Airport, and Ontario Highway 401 (the Macdonald-Cartier Freeway) are all named after him. John Alexander Macdonald was known to be quite a drinker – to the point his drinking would sometimes get in the way of politics. John’s first wife Isabella Macdonald was John’s first cousin. Apparently cousin marriage was no big deal back in the day. Back side of the bill features The Canadian train winding through Rockies as a tribute to Sir John Macdonald as the main driving force behind Trans Canadian Railway. – British Columbia joined Canada in 1871 with the promise that it will be included in Trans Canadian railway project. People of BC were also given large sums of money as part of the deal to repay their debts. – Overall cost of the project was estimated around $100,000,000 which was a monstrous amount of money in that time. – The project caused First Nations rebellion in Manitoba against Canadian government which lasted 6 months but ended after Canadian troops were brought in. – The railway was completed in on Nov. 7th, 1885 in Craigellachie, BC (area between Sicamous and Revelstoke). 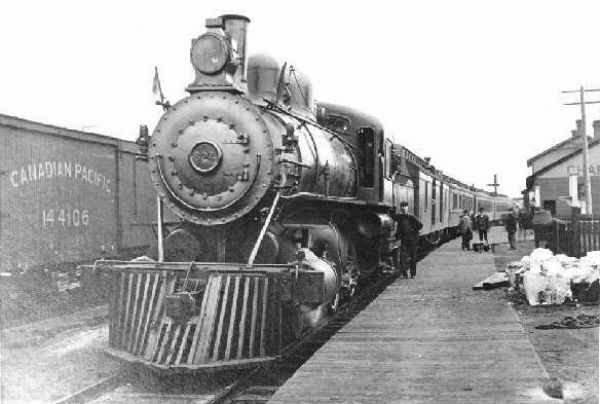 First train arrived at Port Moody from Montreal on July 4th, 1886. – Port Moody was originally the final destination for the railway on the west coast. But by 1886, the Canadian Pacific Railway Company had decided to extend the line further to the West to Vancouver after local businessmen promised to fund the extension for their own benefit. – Ride between Montreal and Port Moody was five days and nineteen hours long. awesome and really good information for readers. in your content seem to be running off the screen in Internet explorer. know. The design and style look great though!